Back in early September, during the installation period of the 9a Bienal do Mercosul | Porto Alegre in Brazil, several of us working on the project occasionally took a break and met at the terrace of the cultural center Usina do Gasometro to experience the sunset. 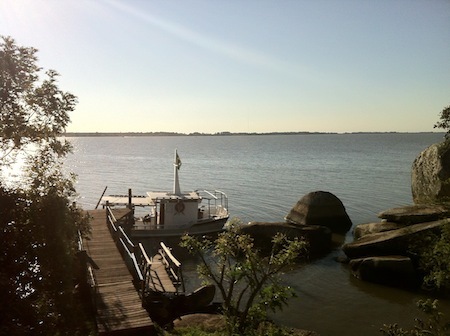 Up until that point, a period of cold, rainy days had overextended its stay, but Southern winds had taken mercy on us for a little over a week, blowing away clouds far into the Atlantic and leaving bare the skies over Porto Alegre’s river, lake, or estuary whatever called Guaíba. Whenever weather permitted, during the following nine weeks of the exhibition period we continued frequenting that terrace to observe the sun apparently sink into the Guaíba, and with that, to welcome the depths of a day arise with the dimmer light that’s night. That landscape. How much time it occupied my mind; the minds of others, too. Once a month, from May to November, we had taken a boat that docked at the Usina and navigated into the Guaíba for a voyage of about 12 kilometers—coincidently, a similar distance between troposphere and atmosphere, and also the extent of thread used in Jason Dodge’s textile sculptures included in the exhibition—until reaching a little rocky island locally known as Ilha do Presídio. Our vessel did not exactly have the engine of a speedboat, so it took us over an hour to get to the island, another or more to get back. We had time, though, and good company. With a geological history dating back millions of years, this now-abandoned, former prison-island for political detainees was one of the venues of the Bienal, whilst not as host to the exhibition. That minute remain of continental split was the conceptual anchor and physical site of Island Sessions, a discussion and publication initiative of the Bienal that directly involved more than one hundred participants. I’ve made a video to introduce you to the Ilha do Presídio and to Island Sessions. Clearly, the video is homemade, like this blog, so don’t expect being blown away by it, although the Ilha could and would have done so to some of us who visited. It’s just a brief video-clip to show you the place, to tell of the initiative. Its soundtrack includes an instrumental piece and a song created by Mario Garcia Torres for the Bienal. Most importantly: here you can see impressions, as well as read inflections, perceptions and reflections—essays, short stories, anecdotes—authored by participants of Island Sessions. (On the left column, click on a date/session, which is a chapter of sorts, each with individual contributors.) For a geological and cultural history of the island, refer to the essay by Eduardo Bueno; for a conceptual approach to the island, read instead a piece by Sarah Demeuse; for writings in prison or imprisonment and writing, consult an image/text work by Angie Keefer; for either a recipe or a timeline on censorship, go to the contributions by Luiza Proença; and so on. Anyhow, it was good to be there: chilling on the Usina’s terrace at sundown; navigating the Guaíba; visiting its Ilha; spending time in Porto Alegre; being involved in the project. Indeed, the Bienal has now closed. After that fact, and, eventually, after a voyage in the high seas of the Pacific visiting remote islands and experiencing sunsets from places afar, this time around witnessing sunrises, too, I am finally back home contemplating other scenarios. Now, here, more so than memories of the Bienal, there are a number of questions that keep emerging. Among these, a nagging one: What is will? More amply: How does such a thing, a palpable sensibility of sorts, a force from a wholly unbeknownst source, shape language in the visual arts, create conditions for its expression?